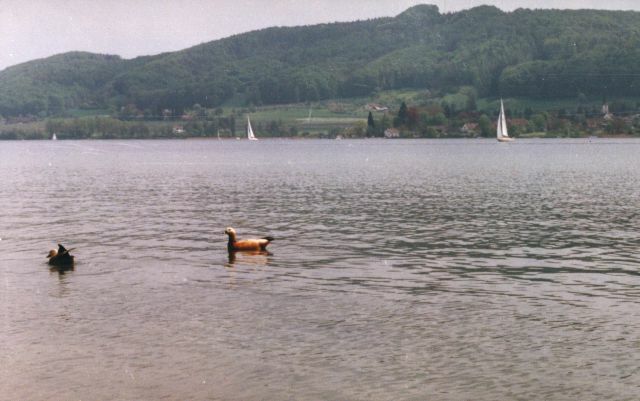 A bit of geography..: Lake Constance is positioned between Germany, Austria and Switzerland. For an ordinary stupid Dane, all of that big pond down there is Lake Constance (Bodensee), but in reality it is quite different. In the north-western part (the prettiest) is no longer called Lake Constance, because up there it splits up into two-three fingers, one of which becomes The Rhine. Further more, the trip had to start, and end, at locations with fairly good public transportation. Quite important, because we had no intentions of paddling the same way back.!! We headed south, a bit faster than expected, so I think the current helped us a bit. The weather was unbelievably nice, sun and blue sky - T-shirt.! We arrived pretty quickly at a place called Marienschlucht, an incredibly beautiful, cosy little corner. The bank has so far been almost cliff-like. It is really rough terrain in this area of Überlinger See. After a well-deserved rest - in our own opinion - we continued farther south, towards a campsite just north of Dingelsdorf (Klausenhorn), where we spent the night. The next morning I was wondering whether I was too old for this camp-life, I felt like my whole body was aching, but after a bit of exercise, I noticed that the birds were singing in the beautiful sunshine. Heading south again, by now the landscape much flatter, we approach areas with reeds. We had planned to take a look at Mainau, a flower park on a small island, but the entrance fee was about the same price as a two course meal in a restaurant, so we settled for lunch outside the gate, on the wastewater pump station of the island - it did not ruin the flavour.! On our way we passed the island, so we got a fairly good view of the flowers from the lakeside...... Our day on the lake ended in Staad, that lies on the outskirts of Konstanz. In the evening we took the bus to Konstanz for dinner, and to have a look at Konstanz's very much discussed landmark. It is a slightly daring female, at about 25M of height, rotating slowly on her post, right at the waterfront in the harbour. She holds a former bishop in one of her hands, and a ditto mayor in the other. The next morning we took the ferry across Überlingen to Meersburg, a beautiful old town, with an ancient castle and a newer palace - it is a very special town, because it is practically built in two levels. Farther south again, this area not so pretty as it is simply overbuilt, we continueed around the corner, and headed west towards Konstanz. Now the current was so strong that you had to keep an eye on it. It was the first time I had encountered a bit of current with the kayak, but I got by. We took a rest after Konstanz, when the surroundings were scenic again. From there on there was plenty of flat county and reeds, with The Alps as background - great.!! 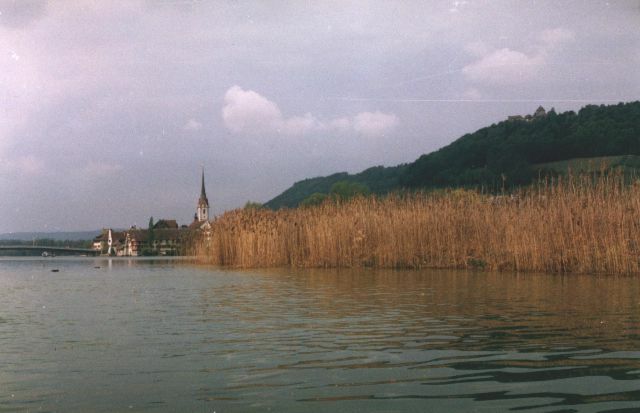 According to my map, and Irene's local knowledgement, it should be possible to cross the dam, to the island Reichenau, but the reeds just seemed to go on forever, but when we had almost given up hopes of finding the hole, it was right in front of us. 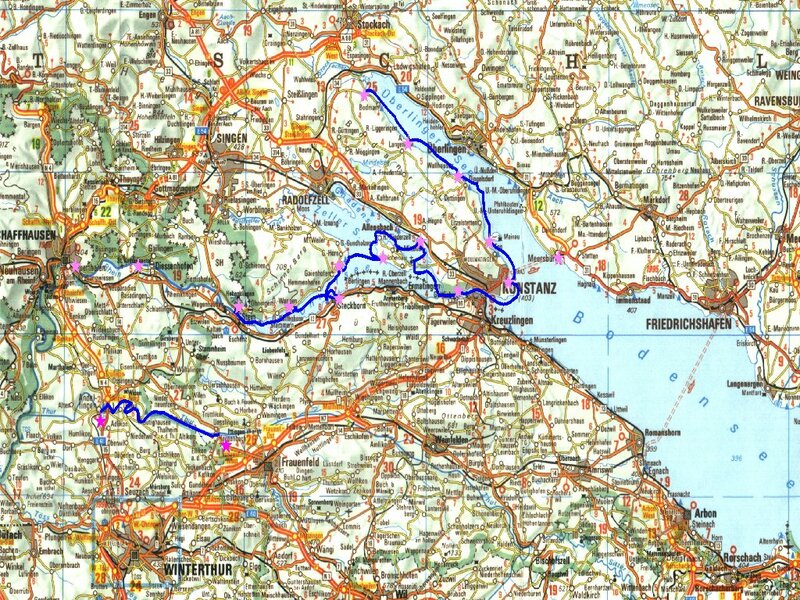 It would have been silly if we had had to paddle all the way around Reichenau.! We crossed the dam, and into the water on the other side. At first it looked like we had just come to a 'lake' in the reed, but fortunately there was a way out of it. Now we were able to head directly to Hegne, but the weather started to turn bad. We could hear a distant thunder, see a lot of black clouds and feel the wind gaining. Therefore, the paddles were shifted into a higher gear, the last part of the way - I could basically only paddle in the right side here, due to the wind. It was tough.! We managed to reach the beach, before the thunder and rain caught up on us. Next morning the weather was fairly hazy and windy, so we were pretty certain that day would be one of the shorter 'march' distances. We struggled towards Reichenau - and once again I could practically only use one arm, due to the wind. 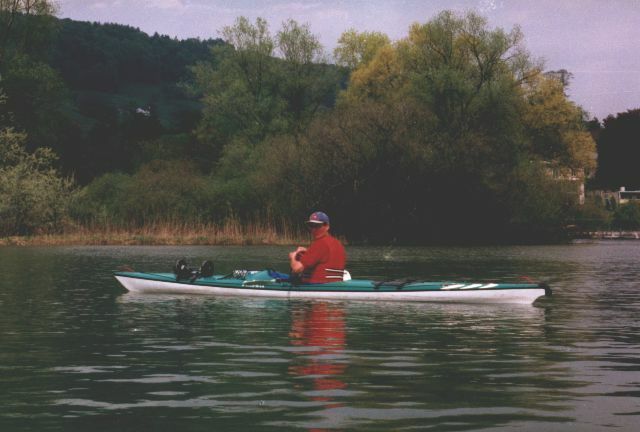 This made me rather well done on my right foreleg, so I enjoyed it a lot when we got around the North tip of Reichenau at last, and I could perform some normal and relaxed paddling. We wasted a bit of time in Niederzell, where we tried to shop, but there were no shops! Therefore, we continued a little further, to Bradlen Camping. This is a real nice camp that has a cafeteria in the open, with a beautiful view over Untersee, and now that the bad weather had long gone - there was nothing better to do than to enjoy the evening. 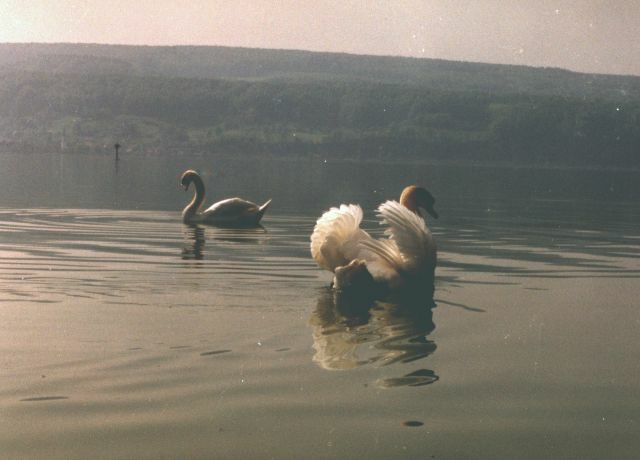 Because we had seen so much reed and wildlife birds, we did not have an urge to paddle farther into Gnadensee/Zeller See. Therefore, we continued towards The Rhine. The weather was, as mentioned, great again. After a long and pleasant lunch-rest, and a lot of nice paddling, we reached Steckborn, Switzerland. We stayed at a hotel in Steckborn - nice with a real bed, and our very own bathroom.! 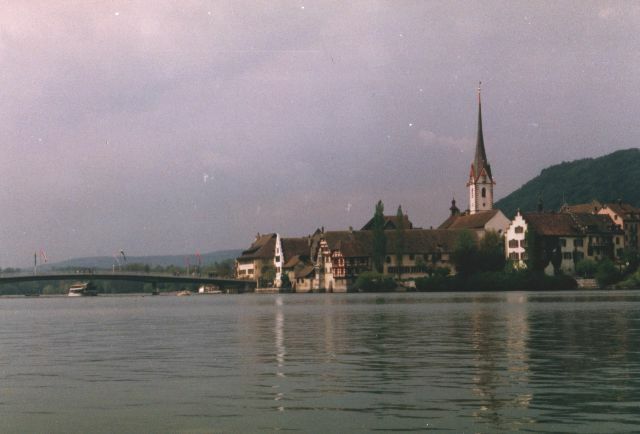 In the morning we headed for Stein am Rhein. The weather was all right, though a bit windy, and the water was quite choppy. It was our intention to cross to the other side of Untersee, to get the nicest view at the mountains - do I have to tell you that it is Switzerland's..?? Becasuse by now I had learned that Zig-Zag is a challenging acquaintance in side-wind, I chose to paddle straight up against the wind, and follow the bank later. 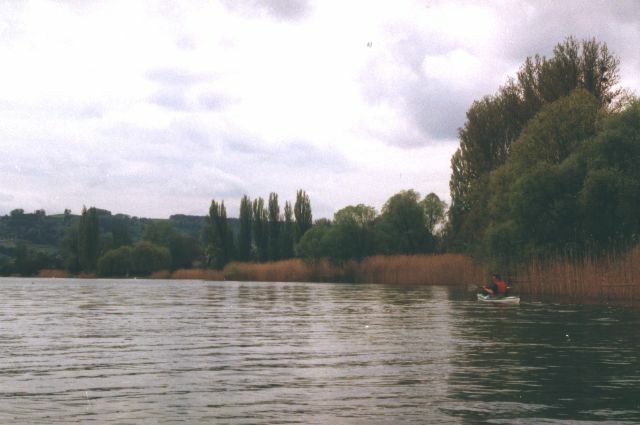 The paddling was getting more and more relaxed, due the current increasing towards Stein am Rhein. Just outside the town, it is an advantage to keep to the left(South), then you will get a prettier route behind a couple of small islands, and you will get away from the ferry-route.!! Immediately at the town, the Rhine decreases in width and therefore gains some waves - the largest I would say up to 50 cm. - it was enough to make Irene happy for her new spray skirt.! We checked in at the local youth hostel. In the evening, during a walk, we witnessed a regular storm, thunder and rain in serious amounts, but who cares, by that time we had been on land for hours.! The schedule for that day was Schaffhausen, and we did make it, as usual in bright sunshine. Due to the current, that day too was a real loafing day. At Shaffhausen you have to know where it is possible, and allowed, to land - but my private guide Irene knows about these things. We got permission to store our boats at a local canoe/kayak club, because this was the end for now - next stop, Rhine Falls, a very good reason to get off the river.!! The next thing to do was to take bus/train back to Bodman, to pick up the car. We did plan some more paddling on The Rhine, after the falls, but we did not make it this time. We did go to look at the localities - by car. Instead we went to a waterworld, Alpamare Waterworld by Präfrikon, Zürich See. I can recommend this place for a visit, they have some real great water-slides, for kids like us. We slided down at least 12 times, and due to the 67 steps upwards, it must have been really funny - otherwise we would not have bothered. That we did not make the additional Rhine trip, instead we made one on Thur. A river with quite a powerful current, at some stretches it is not for sea-kayaks.! Anyway, because it was a reasonable distance from Irene's, it was an option anyway - keeping clear of the stretches with too strong rapids. Once again Irene knew where it was possible to launch, land, buses etc. Therefore, we started at Uesslingen. At this point the river is basically just a large straight canal, with quite powerful current, so we could loaf most of the time. Once in between we had to steer a bit, where the waters were rougher. Then, at one more 'rapid', I felt like a pro - until I was almost through and I could see that my course was dead wrong for the next wave. The height was not alarming, but the angle, and my balance didn't exactly fit - and I didn't have the time to turn the kayak, bracing was something that I hadn't heard of yet. After a few hundred metres Irene succeeded in getting hold of my kayak and dragged it to the bank, at a suitable place. Time for change of clothes - YES, I had dry clothes with me.! Lunch time.!! All in all - a vacation I never will forget, or regret for that matter..!! Allow me to add some boring info. Even though this area of the globe should be considered as a border area, it is VERY few places in this part of Germany that accepts creditcard - furthermore, the distances between banks or tellers are to large. This problem doesn't exist in Switzerland. Wednesday noon, the shops closes as if it were a Saturday.!! The liners creates waves of about half a meters height. On the Rhine the sail on the green side of the signs.! So be aware of where you are paddling, the liners are big, fast and at places the sail frequently. I suppose we were a bit lucky with the weather, but in spite the season, the weather often improves around full moon - worth remembering.! We actually only had one day on the lakes where I started with long sleeves but it only lasted for about an hour - then I wore T-shirt again. I have omitted, almost, to tell about all the wonderful place we've rested, eaten etc. This goes for all the hikes we made - I have to stop at some point. If you're going to invest in a paddle anyway, then don't be scrooge and save the 7$ for a pair of drop-rings. While my spray-skirt basically was completely dry all the time, Irene's were soaking wet - until she also got a pair. 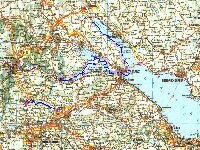 The total kilometres adds up to 80 km on the lakes and the Rhine, then comes the 15 km on Thur.